Are you certain that everything is playing nice and not knowing that one of these days a disaster (earthquake, flood, theft or fire) might happen? Let’s hope not……It will be too late to find out that all important files stored in your computer have disappeared. For whatever reason that might be, these unforeseen events might occur. You might have accidentally deleted some files or your hard drive has just suddenly crashed or that someone stole your computer. Why would you neglect backing up files? That’s not a good practice at all. Why not start a good habit of regular backups? With a backup of your files or an image of your Hard Drive, you can be up and running after a disaster in 30-45 minutes or so. In fact having files and an image backed up makes good sense, redundancy backup is good in this case, backup as often as you want. There are several easy options to perform a backup; even novice Users will be able to do this. 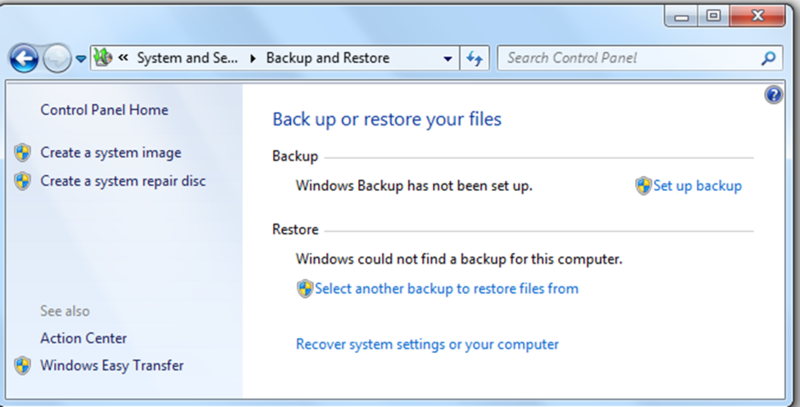 Microsoft has its own built-in tool backup application in Windows Vista and Windows 7 called Backup and Restore. It can be found at Control Panel\System and Security\Backup and Restore. A good Cloud backup solution might be a feasible option. Sky Drive is a Free online backup solution from Microsoft. “Cloud” is a new trendy term which simply means “The Internet” and generally refers to apps, and/or backups being stored and accessed from the net. In this Article we will be focusing on giving simple guides on how to use SyncToy and DriveImage XML as backup solutions, both are Free Programs for Personal Use Only. SyncToyis a great tool from Microsoft. You may backup selected folders/files only and choose if you want to Synchronize, Echo and Contribute. Operating Systems compatibility: It supports both 32-bit and 64-bit versions of Windows XP, Windows Vista, and Windows 7. Locate and open the SyncToy program from your computer. 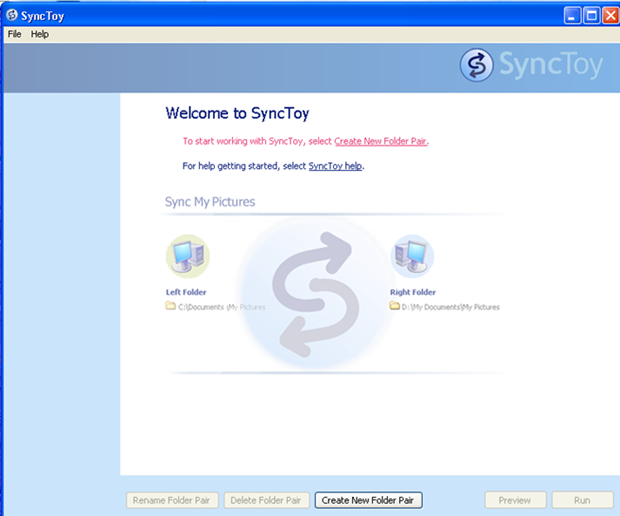 In the Welcome to SyncToy screen click on Create New folder Pair. 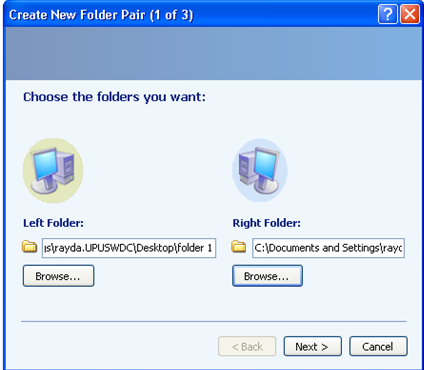 Once the two folders are created, from the Left Folder click on Browse and locate the Folder that you want to back up, from the Right Folder, click on Browse and locate the Folder you wish to use as a backup. You may choose if you want to Synchronize, Echo or Contribute. A description for each one is available on the images called ‘Short Explanation’. Now that you have chosen the preferred backup that you want, choose a Name for your folder pair. In this guide I named it ‘My Backup’. Click on Finish then click on Run, to run the Backup. 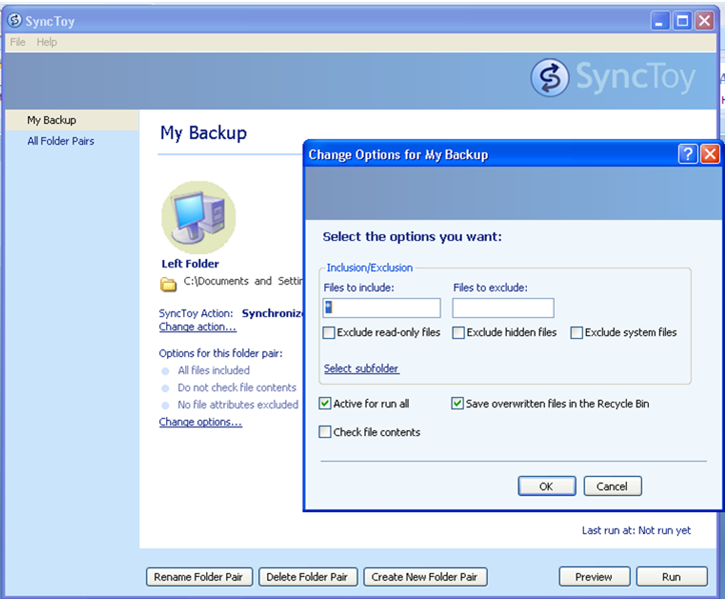 Once you have setup your SyncToy backup, if you wish to edit the backup you may choose either Change Actions and/or Change Options. Another great idea – is to create an image of your computer’s hard drive. If you’d like to back up your entire hard drive try DriveImage XML. This Free program is not for commercial use. Operating Systems compatibility: Windows XP, Vista and Windows 7 and Windows Server 2003. 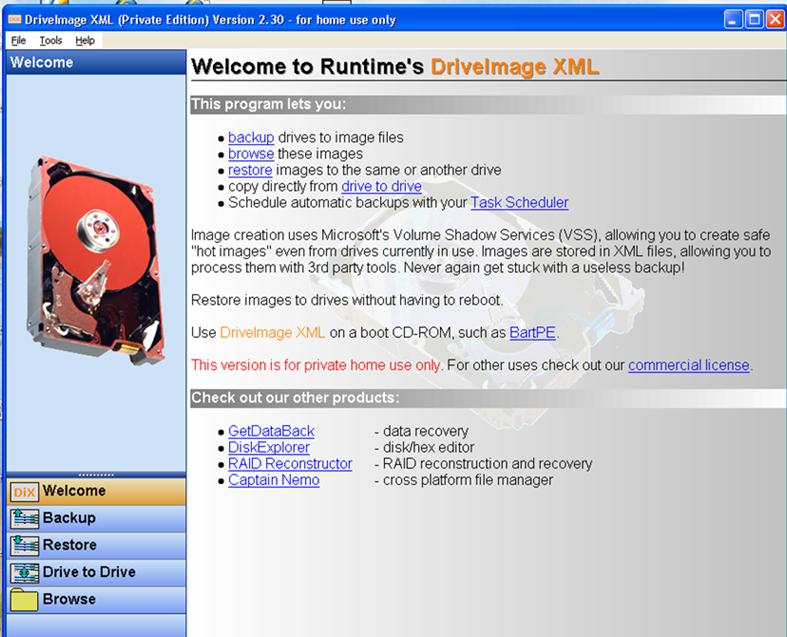 DriveImage XML will Backup, Image and Restore drives formatted with FAT and NTFS. 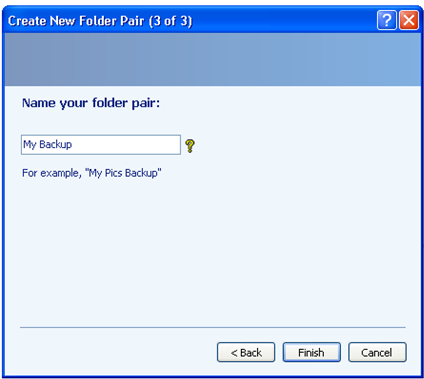 To begin, choose Backup from the Menu, and select the Drive that you want to Backup….. 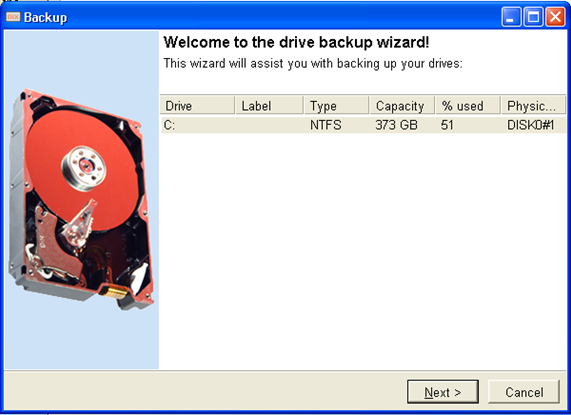 In the Welcome to the drive backup wizard, click on Next….. Select the Backup location; since my computer’s hard drive has only one Partition which is the C Drive, I will use the same drive which is the Drive C. I can always transfer the image files to another network location or external hard drive later on when the whole process is done. If you have an external hard drive connected to your computer you may change the backup location. Under Options, leave the default to Split large files and in Compression choose None. In Hot Imaging Strategy, leave the default which is Try Volume Locking First. Click on Next…. The backup is now in progress, click on Finish after. We have just concluded an Image backup of your hard drive. If you need to Restore the backup image, you would select Restore from the Main Menu and locate the Image files. It is that simple. Note: This Article is intended for Personal use only. Please see my upcoming blogs on backup solutions intended for Business/Commercial use.